A baby sloth bear was born at NaturZoo Rheine in Germany in December, but it was kept under wraps so the newborn could bond with its mother in peace. Little Niko, born to his mother Devi and father Franz, greeted the world on December 6, 2014. The first few months of a sloth bear’s life are crucial. According to NaturZoo Rheine’s Facebook page, newborn sloth bears are blind, nearly hairless, and about the size of a guinea pig. Niko spent the first few months of his life alone with his mother in a dark, sound-proof room, under the watchful eye of a hidden camera. At that age, his father is kept separate because he is considered a threat to the baby’s health. Sloth bear births in zoos are very rare and caring for them can be challening. According to NaturZoo Rheine, there are just 25 sloth bears currently living in European zoos. Niko is just now beginning to explore his outdoor surroundings, so stay tuned to the NaturZoo Rheine Facebook page for updates! The reclusive sloth bear lives in the forests of South Asia, feeding on fruits, flowers, termites, ants, and other insects. They have special long, curved claws that allow them to dig deep into nest mounds to find food. These nocturnal animals tend to keep to themselves. They usually rock a shaggy black coat with a cream-colored snout, and their chest is occasionally marked with a light ‘V’ or ‘Y’ design. 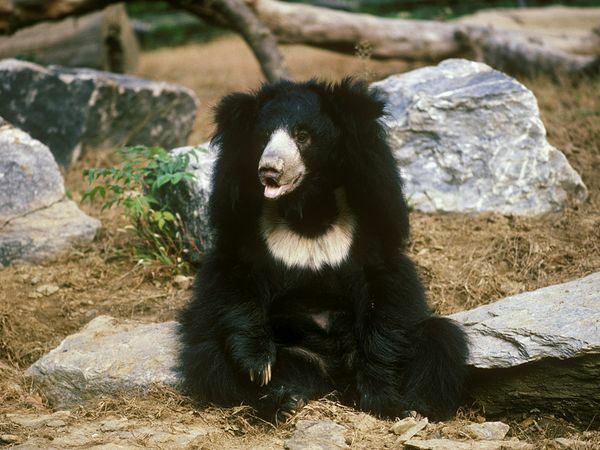 Sloth bears can live up to 40 years in the wild and grow to be nearly 300 pounds! Unfortunately, sloth bears are incredibly vulnerable, threatened by habitat loss and sometimes capture. Fun Fact: Sloth bears carry their cubs on their back! This is considered a unique trait among bears. ← Even the Sky is Begging For a Green Beer on St. Patrick’s Day!